A couple of weekends ago our good buddy Mike came over for movie night. Which consisted of I Am Legend + The Taste of Tea. I only really wanted to see I Am Legend (on Blu-ray) for the CG scenes of empty New York. Which it delivered on. It didn’t deliver on much else. (Solid performance by Sam though – pictured at left). The clear winner was The Taste of Tea. 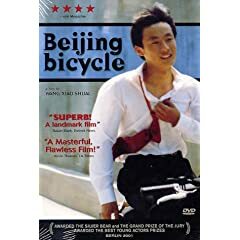 Mike didn’t know much about it, so I was really worried that it was going to be another Beijing Bicycle (which had been a harsh lesson in ‘don’t judge a movie by its english cover’). But it wasn’t. It was 143 minutes of surrealist … well, not ‘surrealist fun’, but something like that. Irresistibility? The many fantastical elements make The Taste of Tea feel like live-action anime. (Which couples well with the mother and grandfather’s occupations as illustrators.) There are actually some themes and specific scenes (the countryside train) which reminded me strongly of Spirited Away. The Taste of Tea does go on. So load up on snacks. If you’re going to dive in, push through the first 15 or so minutes, which I didn’t especially enjoy. If you keep going you’re rewarded with some beautiful long, unaffected shots of Japanese countryside. But more than that, with many captivating, sometimes bizarre, sequences. Sachiko, the young daughter, was easily my favourite storyline. Sachiko spends most of the movie trying to deal with a giant version of herself which follows her, and which she can’t make go away. It’s a rare, quality treatment of the inner life and logic of little people. The elaborate plans you come up with to deal with things you don’t understand, or which are only the product of your imagination. Making them none the less real to you. It’s wonderfully done.